On April 4, 2019, New York‘s governor, Andrew M. Cuomo, announced both the completion of a mixed-use affordable housing project based on adaptive reuse, and the start of new affordable housing project based on regenerating a blighted, 27-acre former shopping plaza with townhomes. Both of them are on the East Side of Buffalo; an area that’s currently the focus of significant revitalization efforts (previously documented here in REVITALIZATION). 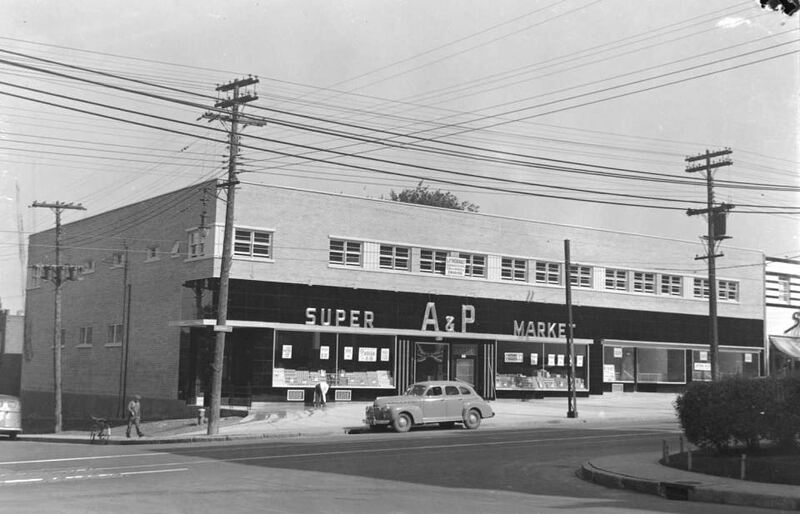 A typical A&P supermarket in 1941. This one was in Snowdon, Quebec, Canada. First up is the completion of AP Lofts at Larkinville. This is a $40 million rehabilitation of the former Atlantic and Pacific Tea Company (A&P) warehouse, which had been vacant for some 45 years. 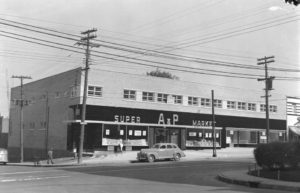 A&P used to be the largest retailer in the U.S., but went out of business in 2015 after 156 years in operation. Simultaneously, Governor Cuomo announced the groundbreaking of Elim Townhomes. , which is part of an overall effort to redevelop the former Central Park Plaza. Together, the developments will create 177 new affordable homes and over 4,100 square feet of ground floor commercial space. 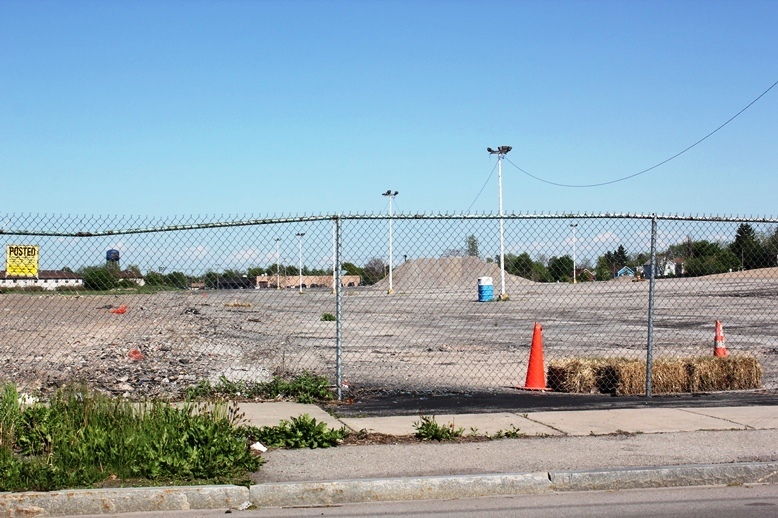 The two housing and community development projects further New York State’s ongoing revitalization efforts of Buffalo’s East Side. A common area in AP Lofts, with a display documenting the heritage of the building. Andrew Cuomo’s commitment to improving access to safe, affordable housing is reflected in the State’s unprecedented $20 billion, five-year Housing Plan. The plan makes housing accessible and combats homelessness by building or preserving more than 100,000 affordable homes and 6,000 with supportive services. The plan is a comprehensive approach to statewide housing issues and includes multi-family and single-family housing and community development. Since 2011, HCR has invested more than $112 million on Buffalo’s East Side that has built or preserved 1,217 affordable apartments. This has created affordable housing for more than 2,700 people. 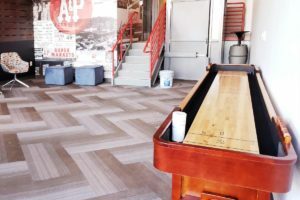 AP Lofts at Larkinville transforms the historic Atlantic & Pacific Tea Company—which has been vacant since 1975—into a vibrant 147-unit, loft-style apartment complex with a farm-to-table restaurant and brew pub on the ground floor. The majority of the one and two-bedroom apartments will be affordable to households at or below 60 percent of the Area Median Income and with 28 apartments for households at or below 130 percent of the Area Median Income. Belt Line Brewery & Kitchen occupies 4,100 square feet of commercial space on the ground floor facing Hamburg Street. Originally built in 1910, the eight-story warehouse was added to both the State and National Registers of Historic Places in 2015. The building renovations included interior demolition; all new interior partitions; updated mechanical, electrical and plumbing systems; and new roofing, elevators and windows. The energy-efficient building includes EnergyStar lighting fixtures and appliances, motion sensor activated lighting and low flow plumbing fixtures. New York State Homes and Community Renewal’s financing for AP Lofts at Larkinville included $6.5 million in tax-exempt bonds, federal Low-Income Housing Tax Credits that generated $9.9 million in equity and an additional $8 million in subsidy. State and federal historic tax credits generated nearly $11.35 million in equity. The City of Buffalo provided $975,000 in HOME funds. The project was developed by KCG Development. 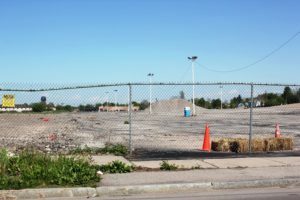 The 27-acre, long-vacant Central Park Plaza. Photo courtesy of Buffalo Rising. Also on the East Side, construction is underway at Elim Townhomes, a $10.7 million, 30-unit affordable housing complex that is part of the redevelopment of the former Central Park Plaza. Elim Townhomes will join the larger Highland Park Village to continue the transformation of the vacant, neglected shopping plaza site into a vibrant residential community, adding affordable homes to the new community, which will eventually include 600 apartments, walk-ups and townhomes, single family homes, a hotel, restaurants and medical services. Elim Townhomes will have five townhome-style buildings with apartments affordable to households with incomes at or below 50 percent of the Area Median Income. Six apartments will be set aside for individuals with a physical disability or traumatic brain injury. Amenities include on-site laundry, a community room with a kitchen area, dedicated storage space in each unit, a playground, an outside seating area and on-site bicycle storage. The development team includes Belmont Housing Resources for WNY and the Elim Community Development Corporation. Elim Townhomes is the first project developed by the Elim Community Development Corporation in affiliation with Elim Christian Fellowship church. State financing for Elim Townhomes includes federal Low-Income Housing Tax Credits that will generate $6.7 million in equity and an additional $3 million in subsidy. The City of Buffalo provided $900,000 in HOME funds. Featured photo is courtesy of AP Lofts at Larkinville. See AP Lofts at Larkinville website.